The whale shark (Rhincodon typus) is a slow-moving, filter-feeding carpet shark and the largest known extant fish species. The largest confirmed individual had a length of 18.8 m (62 ft)  The whale shark holds many records for size in the animal kingdom, most notably being by far the largest living nonmammalian vertebrate. It is the sole member of the genus Rhincodon and the only extant member of the family Rhincodontidae, which belongs to the subclass Elasmobranchii in the class Chondrichthyes. Before 1984 it was classified as Rhiniodon into Rhinodontidae. The whale shark is found in open waters of the tropical oceans and is rarely found in the water below 21 °C (70 °F). Modeling suggests a lifespan of about 70 years, and while measurements have proven difficult, estimates from field data suggest they may live as long as 130 years Whale sharks have very large mouths and are filter feeders, which is a feeding mode that occurs in only two other sharks, the megamouth shark and the basking shark. They feed almost exclusively on plankton and small fishes, and pose no threat to humans. The species was distinguished in April 1828 after the harpooning of a 4.6 m (15 ft) specimen in Table Bay, South Africa. Andrew Smith, a military doctor associated with British troops stationed in Cape Town, described it the following year. The name "whale shark" refers to the fish's size, being as large as some species of whales, and also to its being a filter feeder like baleen whales. Whale sharks have a mouth that can be 1.5 m (4.9 ft) wide, containing 300 to 350 rows of tiny teeth and 20 filter pads which it uses to filter feed. Unlike many other sharks, whale sharks' mouths are located at the front of the head rather than on the underside of the head. Whale sharks have five large pairs of gills. The head is wide and flat with two small eyes at the front. Whale sharks are grey with a white belly. Their skin is marked with pale yellow spots and stripes which are unique to each individual. The whale shark has three prominent ridges along its sides. Its skin can be up to 15 cm thick. The shark has two dorsal fins and a pair of pectoral fins. Juveniles' tails have a larger upper fin than the lower fin, while the adult tail becomes semilunate. The whale shark's spiracles are just behind its eyes. The whale shark is the largest non-cetacean animal in the world. The average size of adult whale sharks is estimated at 9.8 m (32 ft) and 9 t (20,000 lb). Several specimens over 18 m (59 ft) in length have been reported. The largest verified specimen was caught on 11 November 1949, near Baba Island, in Karachi, Pakistan. It was 12.65 m (41.5 ft) long, weighed about 21.5 t (47,000 lb), and had a girth of 7 m (23 ft). Stories exist of vastly larger specimens – quoted lengths of 18 m (59 ft) and 45.5 t (100,000 lb) are common in the popular literature, but no scientific records support their existence. In 1868, the Irish natural scientist Edward Perceval Wright obtained several small whale shark specimens in the Seychelles, but claimed to have observed specimens in excess of 15 m (49 ft), and tells of shark specimens surpassing 21 m (69 ft). In a 1925 publication, Hugh M. Smith described a huge animal caught in a bamboo fish trap in Thailand in 1919. The shark was too heavy to pull ashore, but Smith estimated the shark was at least 17 m (56 ft) long, and weighed around 37 t. These measurements have been exaggerated to 43 t (95,000 lb) and a more precise 17.98 m (59.0 ft) in recent years. A shark caught in 1994 off Tainan County, southern Taiwan, reportedly weighed 35.8 t (79,000 lb). There have even been unverified claims of whale sharks of up to 23 metres (75 ft) and 100 tonnes (220,000 lb). In 1934, a ship named the Maurguani came across a whale shark in the southern Pacific Ocean, rammed it, and the shark became stuck on the prow of the ship, supposedly with 4.6 m (15 ft) on one side and 12.2 m (40 ft) on the other. No reliable documentation exists for these claims and they remain "fish stories". The complete and annotated genome of the whale shark was published in 2017. The whale shark inhabits all tropical and warm-temperate seas. The fish is primarily pelagic, living in the open sea but not in the greater depths of the ocean, although it is known to occasionally dive to depths of as much as 1,800 metres (5,900 ft). Seasonal feeding aggregations occur at several coastal sites such as the southern and eastern parts of South Africa; Saint Helena Island in the South Atlantic Ocean; Gulf of Tadjoura in Djibouti, Gladden Spit in Belize; Ningaloo Reef in Western Australia; Kerala, Lakshadweep, Gulf of Kutch and Saurashtra coast of Gujarat in India; Útila in Honduras; Southern Leyte; Donsol, Pasacao and Batangas in the Philippines; off Isla Mujeres and Isla Holbox in Yucatan and Bahía de los Ángeles in Baja California, México; Maamigili island, Maldives; Ujung Kulon National Park in Indonesia; Cenderawasih Bay National Park in Nabire, Papua, Indonesia; Flores Island, Indonesia; Nosy Be in Madagascar; off Tofo Beach near Inhambane in Mozambique; the Tanzanian islands of Mafia, Pemba, Zanzibar; Gulf of Tadjoura in Djibouti, the Ad Dimaniyat Islands in the Gulf of Oman and Al Hallaniyat islands in the Arabian Sea; and, very rarely, Eilat, Israel and Aqaba, Jordan. Although typically seen offshore, it has been found closer to land, entering lagoons or coral atolls, and near the mouths of estuaries and rivers. Its range is generally restricted to about 30° latitude. It is capable of diving to depths of at least 1,286 m (4,219 ft), and is migratory. On 7 February 2012, a large whale shark was found floating 150 kilometres (93 mi) off the coast of Karachi, Pakistan. The length of the specimen was said to be between 11 and 12 m (36 and 39 ft), with a weight of around 15,000 kg (33,000 lb). In 2011, more than 400 whale sharks gathered off the Yucatan Coast. It was one of the largest gatherings of whale sharks recorded. Aggregations in that area are among the most reliable seasonal gatherings known for whale sharks, with large numbers occurring in most years between May and September. Associated ecotourism has grown rapidly to unsustainable levels. The whale shark is a filter feeder – one of only three known filter-feeding shark species (along with the basking shark and the megamouth shark). It feeds on plankton including copepods, krill, fish eggs, Christmas Island red crab larvae  and small nektonic life, such as small squid or fish. It also feeds on clouds of eggs during mass spawning of fish and corals. The many rows of vestigial teeth play no role in feeding. Feeding occurs either by ram filtration, in which the animal opens its mouth and swims forward, pushing water and food into the mouth, or by active suction feeding, in which the animal opens and closes its mouth, sucking in volumes of water that are then expelled through the gills. In both cases, the filter pads serve to separate food from water. These unique, black sieve-like structures are presumed to be modified gill rakers. Food separation in whale sharks is by cross-flow filtration, in which the water travels nearly parallel to the filter pad surface, not perpendicularly through it, before passing to the outside, while denser food particles continue to the back of the throat. This is an extremely efficient filtration method that minimizes fouling of the filter pad surface. Whale sharks have been observed "coughing", presumably to clear a build-up of particles from the filter pads. Whale sharks migrate to feed and possibly to breed. A juvenile whale shark is estimated to eat 21 kg (46 pounds) of plankton per day. 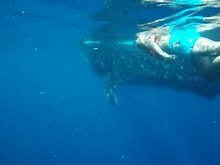 The BBC program Planet Earth filmed a whale shark feeding on a school of small fish. The same documentary showed footage of a whale shark timing its arrival to coincide with the mass spawning of fish shoals and feeding on the resultant clouds of eggs and sperm. Whale sharks are known to prey on a range of planktonic and small nektonic organisms that are spatiotemporally patchy. These include krill, crab larvae, jellyfish, sardines, anchovies, mackerels, small tunas, and squid. In ram filter feeding, the fish swims forward at constant speed with its mouth fully open, straining prey particles from the water by forward propulsion. This is also called ‘passive feeding’, which usually occurs when prey is present at low density. 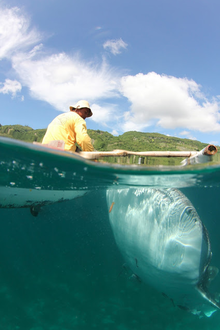 In Oslob, Philippines, whale sharks are fed shrimp to return every morning for tourists and divers. Despite its size, the whale shark does not pose any danger to humans. Whale sharks are docile fish and sometimes allow swimmers to catch a ride, although this practice is discouraged by shark scientists and conservationists because of the disturbance to the sharks. Younger whale sharks are gentle and can play with divers. Underwater photographers such as Fiona Ayerst have photographed them swimming close to humans without any danger. The shark is seen by divers in many places, including the Bay Islands in Honduras, Thailand, Indonesia, the Philippines, the Maldives close to Maamigili (South Ari Atoll), the Red Sea, Western Australia (Ningaloo Reef, Christmas Island), Taiwan, Panama (Coiba Island), Belize, Tofo Beach in Mozambique, Sodwana Bay (Greater St. Lucia Wetland Park) in South Africa, the Galapagos Islands, Saint Helena, Isla Mujeres (Caribbean Sea), La Paz, Baja California Sur and Bahía de los Ángeles in Mexico, the Seychelles, West Malaysia, islands off eastern peninsular Malaysia, India, Sri Lanka, Oman, Fujairah, Puerto Rico, and other parts of the Caribbean. Juveniles can be found near the shore in the Gulf of Tadjoura, near Djibouti, in the Horn of Africa. There is currently no robust estimate of the global whale shark population. The species is considered endangered by the IUCN due to the impacts of fisheries, bycatch losses, and vessel strikes, combined with its long lifespan and late maturation. In June 2018 the New Zealand Department of Conservation classified the whale shark as "Migrant" with the qualifier "Secure Overseas" under the New Zealand Threat Classification System. It is listed, along with six other species of sharks, under the CMS Memorandum of Understanding on the Conservation of Migratory Sharks. In 1998, the Philippines banned all fishing, selling, importing, and exporting of whale sharks for commercial purposes, followed by India in May 2001, and Taiwan in May 2007. In 2010, the Gulf of Mexico oil spill resulted in 4,900,000 barrels (780,000 m3) of oil flowing into an area south of the Mississippi River Delta, where one-third of all whale shark sightings in the northern part of the gulf have occurred in recent years. Sightings confirmed that the whale sharks were unable to avoid the oil slick, which was situated on the surface of the sea where the whale sharks feed for several hours at a time. No dead whale sharks were found. Hundreds of whale sharks are illegally killed every year in China for their fins, skins, and oil. The whale shark is popular in the few public aquariums that keep it, but its large size means that a very large tank is required and it has specialized feeding requirements. Their large size and iconic status have also fueled an opposition to keeping the species in captivity, especially after the early death of some whale sharks in captivity and certain Chinese aquariums keeping the species in relatively small tanks. The first attempt at keeping whale sharks in captivity was in 1934 when an individual was kept for about four months in a netted-off natural bay in Izu, Japan. The first attempt of keeping whale sharks in an aquarium was initiated in 1980 by the Okinawa Churaumi Aquarium (then known as Ocean Expo Park) in Japan. Since 1980, several have been kept at Okinawa, mostly obtained from incidental catches in coastal nets set by fishers (none after 2009), but two were strandings. Several of these were already weak from the capture/stranding and some were released, but initial captive survival rates were low. After the initial difficulties in maintaining the species had been resolved, some have survived long-term in captivity. The record for a whale shark in captivity is an individual that, as of 2017, has lived for more than 18 years in the Okinawa Churaumi Aquarium. Following Okinawa, Osaka Aquarium started keeping whale sharks and most of the basic research on the keeping of the species was made at these two institutions. Since the mid-1990s, several other aquariums have kept the species in Japan (Kagoshima City Aquarium, Kinosaki Marine World, Notojima Aquarium, Oita Ecological Aquarium, and Yokohama Hakkeijima Sea Paradise), South Korea (Aquaplanet Jeju), China (Chimelong Ocean Kingdom, Dalian Aquarium, Guangzhou Aquarium in Guangzhou Zoo, Qingdao Polar Ocean World and Yantai Aquarium), Taiwan (National Museum of Marine Biology and Aquarium), India (Thiruvananthapuram Aquarium) and Dubai (Atlantis, The Palm), with some maintaining whale sharks for years and others only for a very short period. The whale shark kept at Dubai's Atlantis, The Palm was rescued from shallow waters in 2008 with extensive abrasions to the fins and after rehabilitation it was released in 2010, having lived 19 months in captivity. Marine Life Park in Singapore had planned on keeping whale sharks, but scrapped this idea in 2009. Outside Asia, the first and so far only place to keep whale sharks is Georgia Aquarium in Atlanta, United States. This is unusual because of the comparatively long transport time and complex logistics required to bring the sharks to the aquarium, ranging between 28 and 36 hours. Georgia keeps four whale sharks: two females, Alice and Trixie, that arrived in 2006, and two males, Taroko and Yushan, that arrived in 2007. Two earlier males at Georgia Aquarium, Ralph and Norton, both died in 2007. 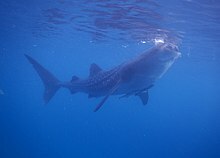 Georgia's whale sharks were all imported from Taiwan and were taken from the commercial fishing quota for the species, usually used locally for food. Taiwan closed this fishery entirely in 2008. In Vietnamese culture, the whale shark is referred to as Ca Ong, or "sir fish". In Malagasy, the whale shark is named "marokintana", meaning 'many stars', after the appearance of the markings on the shark's back. In the Philippines, it is called butanding and balilan. The whale shark is featured on the reverse of the Philippine 100-peso bill. By law snorkelers must maintain a distance of four feet from the sharks and there is a fine and possible prison sentence for anyone who touches the animals. The whale shark is also featured on the latest 2015–2017 edition of the Maldivian 1000 rufiyaa banknote, along with the green turtle. In Japan, it is called jinbei-zame, because the markings on its body resemble a jinbei. For a topical guide to this subject, see Outline of sharks. ^ Cicimurri, David J; Knight, James L (2009). "Late Oligocene sharks and rays from the Chandler Bridge Formation, Dorchester County, South Carolina, USA". Acta Palaeontologica Polonica. 54 (4): 627–647. doi:10.4202/app.2008.0077. ^ a b c Pierce, S. J. & Norman, B. (2016). "Rhincodon typus". IUCN Red List of Threatened Species. 2016: e.T19488A2365291. doi:10.2305/IUCN.UK.2016-1.RLTS.T19488A2365291.en. Retrieved 12 November 2017. ^ Smith, Andrew (5 November 1828). "Descriptions of New or imperfectly known Objects of the Animal Kingdom, found in the South of Africa". The South African Commercial Advertiser. 3 (145) – via Center for Research Libraries Document Delivery System. Reprinted in Penrith (1972). ^ Penrith, M. J. (1972). "Earliest Description and Name for the Whale Shark". Copeia. 1972 (2): 362. doi:10.2307/1442501. JSTOR 1442501. ^ a b c Melville, R. V. (1981). "Opinion 1278. The Generic Name Rhincodon A. Smith, 1829 (Pisces): Conserved". The Bulletin of Zoological Nomenclature. 41 (4): 215–217. ^ Smith, Andrew (1829). "Contributions to the Natural History of South Africa, &c". The Zoological Journal. 4: 443–444. ^ Müller, J.; Henle, J. (1841). Systematische Beschreibung der Plagiostomen. Berlin: Veit und Comp. p. 77. ^ a b c d e f Colman, J. G. Froese, Ranier; Pauly, Daniel (eds.). "Rhincodon typus". FishBase. Retrieved 17 September 2006. ^ Perry, Cameron T.; Figueiredo, Joana; Vaudo, Jeremy J.; Hancock, James; Rees, Richard; Shivji, Mahmood (2018). "Comparing length-measurement methods and estimating growth parameters of free-swimming whale sharks (Rhincodon typus) near the South Ari Atoll, Maldives". Marine and Freshwater Research. 69 (10): 1487. doi:10.1071/MF17393. ISSN 1323-1650. ^ Martin, R. Aidan. "Rhincodon or Rhiniodon? A Whale Shark by any Other Name". ReefQuest Centre for Shark Research. ^ Brunnschweiler, J. M.; Baensch, H.; Pierce, S. J.; Sims, D. W. (3 February 2009). "Deep-diving behaviour of a whale shark Rhincodon typus during long-distance movement in the western Indian Ocean". Journal of Fish Biology. 74 (3): 706–14. doi:10.1111/j.1095-8649.2008.02155.x. PMID 20735591. ^ Compagno, L. J. V. "Species Fact Sheet, Rhincodon typus". Food and Agriculture Organization of the United Nations. Retrieved 19 September 2006. ^ "Whale Sharks, Rhincodon typus". MarineBio.org. Retrieved 17 May 2018. ^ a b Wood, Gerald L. (1976). The Guinness Book of Animal Facts and Feats. Guinness Superlatives. pp. 139–141. ISBN 978-0-900424-60-1. ^ McClain CR, Balk MA, Benfield MC, Branch TA, Chen C, Cosgrove J, Dove ADM, Gaskins LC, Helm RR, Hochberg FG, Lee FB, Marshall A, McMurray SE, Schanche C, Stone SN, Thaler AD (2015). "Sizing ocean giants: patterns of intraspecific size variation in marine megafauna". PeerJ. 3: e715. doi:10.7717/peerj.715. PMC 4304853. PMID 25649000. ^ Mollet, H. F. (2008). "Summary of Large Whale Shark Rhincodon typus Smith, 1828". Archived from the original on 12 March 2012. . Home Page of Henry F. Mollet, Research Affiliate, Moss Landing Marine Laboratories. ^ Maniguet, Xavier (1992). The Jaws of Death: Shark as Predator, Man as Prey. HarperCollins Publishers Limited. ISBN 978-0-00-219960-5. ^ Read, Timothy D.; Petit, Robert A.; Joseph, Sandeep J.; Alam, Md. Tauqeer; Weil, M. Ryan; Ahmad, Maida; Bhimani, Ravila; Vuong, Jocelyn S.; Haase, Chad P. (December 2017). "Draft sequencing and assembly of the genome of the world's largest fish, the whale shark: Rhincodon typus Smith 1828". BMC Genomics. 18 (1). doi:10.1186/s12864-017-3926-9. ISSN 1471-2164. PMC 5513125. PMID 28709399. ^ Howard, Brian C. (28 June 2016). "Whale Sharks Move in Mysterious Ways: Watch Them Online". National Geographic Society. Retrieved 12 August 2016. ^ Kaushik, Himanshu (30 August 2014). "Whale sharks found off Gujarat coast no expats, they are Indian". The Times of India. Retrieved 12 May 2016. ^ Brunnschweiler, Juerg M.; Baensch, H.; Pierce, S. J.; Sims, D. W. (2009). "Deep-diving behaviour of a whale shark Rhincodon typus during long-distance movement in the western Indian Ocean". Journal of Fish Biology. 74 (3): 706–714. doi:10.1111/j.1095-8649.2008.02155.x. PMID 20735591. ^ Hasan, Saad (10 February 2012). "Experts to cut up 40.1-foot long whale shark today". The Express Tribune. ^ de la Parra Venegas, Rafael; Hueter, Robert; Cano, Jaime González; Tyminski, John; Remolina, José Gregorio; Maslanka, Mike; Ormos, Andrea; Weigt, Lee; Carlson, Bruce; Dove, Alistair (29 April 2011). "An Unprecedented Aggregation of Whale Sharks, Rhincodon typus, in Mexican Coastal Waters of the Caribbean Sea". PLoS ONE. 4. 6 (4): e18994. Bibcode:2011PLoSO...618994D. doi:10.1371/journal.pone.0018994. PMC 3084747. PMID 21559508. ^ Joung, Shoou-Jeng; et al. (July 1996). "The whale shark, Rhincodon typus, is a livebearer: 300 embryos found in one 'megamamma' supreme". Environ. Biol. Fish. 46 (3): 219–223. doi:10.1007/BF00004997. ^ Schmidt, Jennifer V.; Chen, Chien-Chi; Sheikh, Saad I.; Meekan, Mark G.; Norman, Bradley M.; Joung, Shoou-Jeng (4 August 2010). "Paternity analysis in a litter of whale shark embryos". Endangered Species Research. 12 (2): 117–124. doi:10.3354/esr00300. ^ Whale Shark (Rhincodon typus) Issues Paper. Department of the Environment and Heritage (Australian Government). May 2005. ISBN 978-0-6425-5082-8. ^ "Tiny whale shark rescued – World news – World environment". Associated Press via NBC News. 2009. ^ Morelle, Rebecca (17 November 2008). "Shark-cam captures ocean motion". BBC News. Retrieved 30 July 2009. ^ Motta, Philip J.; et al. (2010). "Feeding anatomy, filter-feeding rate, and diet of whale sharks Rhincodon typus during surface ram filter feeding off the Yucatan Peninsula, Mexico" (PDF). Zoology. 113 (4): 199–212. doi:10.1016/j.zool.2009.12.001. PMID 20817493. ^ a b Martin, R. Aidan. "Elasmo Research". ReefQuest. Retrieved 17 September 2006. ^ "Whale shark". Ichthyology at the Florida Museum of Natural History. 11 May 2017. Retrieved 17 September 2006. ^ Schmidt, Jennifer V. (4 December 2010). "Whale Sharks are BIG eaters!". The Shark Research Institute. Retrieved 24 April 2016. ^ "Rhincodon typus (whale shark)". Animal Diversity Web. Retrieved 1 September 2016. ^ a b Compagno, Leonard J. V. (26 April 2002). Sharks of the World: An Annotated and Illustrated Catalogue of Shark Species Known to Date: Bullhead, Mackerel and Carpet Sharks. 2. Food & Agriculture Organization of the United Nations (FAO). ISBN 978-92-5-104543-5. ^ "Favorite Wins of 2013". Break.com. p. 1:24. Archived from the original on 26 August 2014. Retrieved 24 September 2014. ^ Whitehead, Darren Andrew (2014) Establishing a quantifiable model of whale shark avoidance behaviours to anthropogenic impacts in tourism encounters to inform management actions, University of Hertfordshire. ^ a b Pictures of the Day: Tuesday, Aug. 04, 2009. Time magazine, "A 40-foot whale shark and a brave snorkeler swim off the South African coast." ^ "Memorandum of understanding on the conservation of migratory sharks" (PDF). Convention on migratory species. p. 10. Retrieved 13 February 2012. ^ National Regulations on Whale Shark fishing. Department of Sustainability, Environment, Water, Population and Communities. ^ COA bans fishing for whale sharks. Taipei Times, 27 May 2007, p. 4. ^ Handwerk, Brian (24 September 2010) Whale Sharks Killed, Displaced by Gulf Oil? National Geographic News. ^ "Hundreds of sharks killed in China". 5 February 2014. ^ "Whale Shark's Death Sparks Debate". wsbtv. 30 November 2007. Archived from the original on 25 March 2010. ^ a b c Moore, M. (25 October 2010). "Conservationists round on Chinese whale shark aquarium". The Telegraph. Retrieved 8 November 2017. ^ a b c Mollet, H. (September 2012). "Whale Shark Rhincodon typus Smith, 1828 in Captivity". Retrieved 8 November 2017. ^ "Dubai hotel releases whale shark back into the wild". Associated Press. 20 March 2010. Archived from the original on 7 August 2015. ^ Chua, G. (16 May 2009). "No whale sharks at Sentosa IR". Wild Singapore News. Retrieved 8 November 2017. ^ "Resorts World considering alternatives to whale shark exhibit". AsianOne Travel. 16 May 2009. Archived from the original on 9 June 2013. ^ Moore, M. (4 June 2006). "Georgia Aquarium Whale Sharks Receive Special UPS Delivery; Two Resident Male Whale Sharks are Joined by Two Females". BusinessWire. Retrieved 8 November 2017. ^ "Aquarium gains two new whale sharks". CNN. 1 June 2007. Archived from the original on 3 June 2007. Retrieved 1 June 2007. ^ a b Sundquist, T. (18 September 2013). "Transporting the World's Largest Fish: A Whale [Shark] of a Task". Promega Connections. Retrieved 8 November 2017. ^ "Whale Shark". Discovery.com. 5 September 2013. Archived from the original on 4 March 2009. Retrieved 3 November 2011. ^ Briggs, Helen (17 May 2018). "Madagascar emerges as whale shark hotspot". BBC News. Retrieved 12 September 2018. ^ Ocean Ambassadors – Sharks. Oneocean.org. Retrieved 23 May 2013. ^ Cannon, Marisa (21 July 2015). "Swimming with whale sharks in the Philippines". cnn.com. CNN. Retrieved 16 August 2015. Colman, J.G. (December 1997). "A review of the biology and ecology of the whale shark". J. Fish Biol. 51 (6): 1219–34. doi:10.1111/j.1095-8649.1997.tb01138.x. PMID 29991171. "Whale Sharks, Whale Shark Pictures, Whale Shark Facts". Animals, Animal Pictures, Wild Animal Facts. 10 September 2010. Wikimedia Commons has media related to Whale sharks.